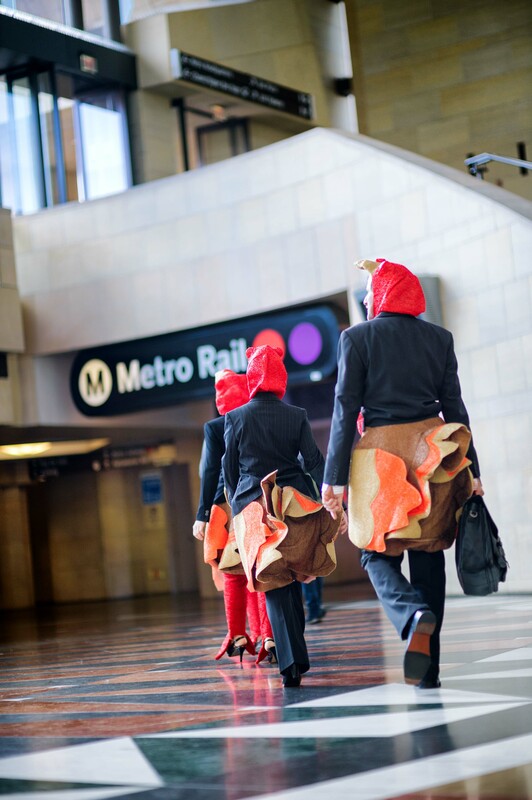 ART OF TRANSIT: The turkeys are out, but it’s not even holiday yet. Hmm. Photo by Steve Hymon/Metro. Monrovia is betting that $25 million in Metro and state funding for a transit plaza, a promenade for live music and food trucks, and a new park with an amphitheater will connect the south part of town and Gold Line station to its vibrant north Myrtle Avenue location. Duarte, not to be outdone, has plans for a hotel and a movie theater, said Mayor Liz Reilly, both amenities Monrovia has had for years. “We will be closer to the Gold Line station than they (Monrovia) are,” she said. The Duarte station lies across the street from its largest employer, City of Hope, a nationally known research and cancer treatment hospital that employs 4,300 people, many of whom she hopes will take the train to and from work. But as the mountains sat down at the mouth of San Gabriel Canyon, the tracks reached APU/Citrus College station at the doorstep of the 1,250-home Rosedale planned development. It may be the first suburban housing project built train-station ready with a plaza to be built within walking distance. Go get ’em, Duarte! 🙂 The Monrovia Station will be interesting as the tracks are on the south side of the 210 and the city’s very nice downtown sits about a mile away on the north side of the freeway. It’s not a crazy long distance between the two, but it’s a walk or bike ride through a more commercial area. It will be very interesting as the years go by to see what kind of linkage develops. One other note: the views of the San Gabriel Mountains from the Foothill Extension tracks should be crazy good. Metro is currently forecasting an early 2016 opening for the line. The graphic compares 2013 median commute times to the previous year’s times (I think), with much of our region hovering around the national average of 25.4 minutes. Any readers care to hazard a guess why more centrally located Alhambra and East L.A. have greater average times than Santa Clarita, a northern ‘burb? The good news, in the long view: Annual congestion-related delay for Greater Los Angeles is still below the peak of 79 hours per motorist reached in 2006, when gas prices were low and the economy was booming. The rise in average commute times is only a few minutes more than in 1990. Wachs said it’s likely people are adjusting their work and travel habits to avoid commuting during rush hour. They work at home, change hours, move closer to their jobs and otherwise try to travel during off-peak periods. Brian Taylor, an urban planning professor at UCLA, agreed with Wachs and Pisarski but cautioned that rising commute times may involve factors beyond street and highway congestion. For example, longer travel distances and greater use of bicycles and public transit can increase trip times. Such a shift might be underway in the Los Angeles area, where the portion of those driving to work has dipped by as many as three percentage points since 1990. My own three cents: most of my friends and acquaintances have pretty normal commutes whether driving, taking transit or walking and/or biking. The folks I know with the really long commutes tend to take Metrolink to travel from outlying ‘burbs to downtown L.A., although I have one friend who has a long-ish drive between Claremont and Riverside. Whereas in the ’90s I knew some people driving crazy long distances (San Juan Capistrano to DTLA, for example) on a daily basis, many people I know seem to be giving more thought to their commutes and transit that may be available when picking places to live, work and play. Some back and forth between the New York MTA — which operates the busy New York Subway system — and the watchdog Citizens Budget Commission. The agency says its capital plan includes money for improvements that riders want, along with a second phase of the Second Avenue Subway (the first phase is under construction). The group points to increasing ridership on the subway and says modernizing the system and maintenance should be the first priorities. Touching essay by Jane Koerner on her father succumbing to Parkinson’s Disease. After church, he took us on drives into the country, navigating the gravel roads by instinct and the position of the sun. No street signs for guidance, acres and acres of plowed prairie the color of daylight, an occasional farmhouse with a bleached barn — nothing like my mountainous Colorado home. Dad never needed to consult a road map…He was fascinated by trains. From the comfort of his easy chair, with the TV chattering nearby, he’d plot a course across the Western United States and Canada, using the railroad timetables and histories that crowded his bookshelf. Today’s fun, easy article to read on transit that doesn’t involve transit: Why fast food chains’ love (and deny) having secret menus (New Yorker) I knew about In-N-Out’s animal style fries but I really didn’t know about the 3×3. Which now I want. And certainly don’t need. First of all, the data shows median times, not mean times, so it doesn’t matter that there are some very long trips from a place like Santa Clarita. More than half of workers in Santa Clarita can find a job in Santa Clarita and don’t need to commute to LA, so the median is relatively low, but the mean is probably much higher. Another example of this is San Bernardino, which is near the bottom of the list for median time, but which has some very long commutes to LA, either driving or on Metrolink. Alhambra, on the other hand, has a lot of choices to find jobs in all directions, so the trip-length frequency distribution is much more spread out, and the median time is higher. Thanks for pointing that out — interesting. I know from driving the 5 freeway up north to the national parks over the past 20 years I’ve been surprised to see the amount of commercial development (in particular offices and warehouses) in the Santa Clarita area. Makes sense that more residents up there are working local. Really, you didn’t know about the 3×3? They have been able to make 100×100 for frat parties. If you’re worried about carbs, try protein style. That’s how I order at the In ‘N Out near LAX; protein style, neopolitan shake, with animal style fries. How have I lived this long without ordering a neopolitan shake from In’n’Out?? I am a bad Angeleno. Alhambra is Valley Blvd. at Fremont, or even just Valley Blvd. I believe it is New York City Transit who operate the subway and buses. The NYMTA is a different type of agency than what we know of as our MTA. The NYMTA is New York STATE agency that FUNDS, not operates, the various transit services (and tunnels) in the New York Tri-state area. All the NYMTA board members are appointed by the governor of New York state, and since this is all STATE money from Albany funding all those NYC area transit options, that makes sense, unlike our locally funded models in California (and the Met Opera and the Met Museum are both really the “State of New York” Opera and “State of New York” Museum along many other supposed NYC institutions are, in fact, totally funded from Albany). NYMTA serves as an omnibus moniker and consumer identity since all those transit and tunnel services depend upon what the MTA does because it is ALL NY state MTA money. Also, Mayor Bloomberg was so angry that he could NOT appoint a single individual to the NYMTA to give NY City (and the mayor) more voice and influence at the MTA since, although all the money comes from Albany, the MTA’s policies and funding directly affects the lives of so many New Yorkers. It was impossible for anyone but the Governor to attempt to fix the scandals and shenanigans at NYMTA, and this is why Bloomberg wanted to have the ability to appoint some of his people, to help clean it up, but that is verboten by law since the NYMTA is all Albany money. I’ll take our locally controlled and funded model any day over the broken NYMTA model.